Have a fling with Spring with this bundle of bacon goodies. 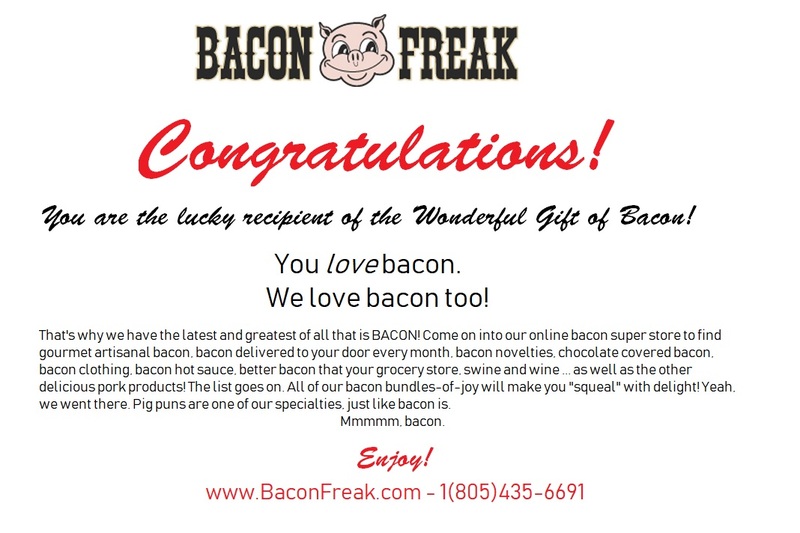 Designed with the beloved bacon freak in mind, this awesome bundle includes our Spring Recipe Collection to serve up some inspiration in the kitchen. And of course, there's the bacon, specifically Bacon Freak Hickory-Smoked Bacon so you can cook up all those tasty recipes. This delicious artisanal bacon is wet cured and hickory smoked. Also included in this bundle is our Applewood Smoked bacon. This is a dry-cured bacon with a subtle sweet flavor on the tongue and a mildly smoky taste. You can compare the wet and dry cured bacons and decide for yourself which you like best. Round out this bodacious bacon bundle with our chocolate covered hickory smoked bacon bringing the ever-popular sweet and salty flavor to a mouth near you! Indicate your preference for milk or dark chocolate above.